This is my first Tree of Life candelabra. It’s sold! 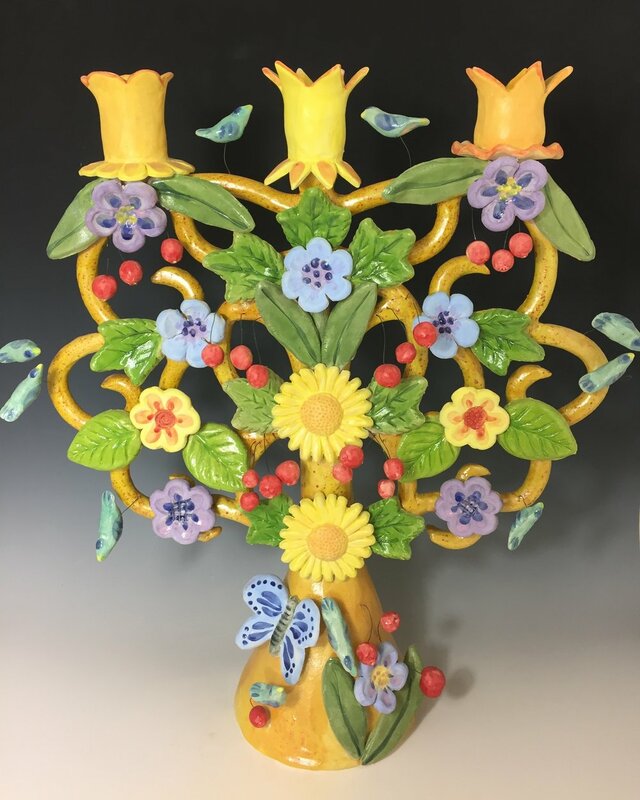 I grew up loving the colorful painted ceramic tree of life candelabras on display in Cost Plus, an import store in San Francisco. I didn’t think of trying to make my own until a clay artist mentioned that she knows how to make them, and would teach a class about it. And so I have begun. My process involves working flat on an outline drawing for my branching structure. I let my coils of clay become semi-dry, then lift up the armature and attach it to a tube base that I have prepared. The add on flowers, leaves and birds are hand made or pressed into molds that I have made in advance. The discovery of the black wire that can withstand the kiln firing was a revelation because it allows me to make the little birds float in the air, and the red berries too. The colors are low fire glazes. I still have much experimenting to do with armature shapes, more decorations to attach, different ways to try the special wire, and different types of glazes. It has been fun to teach my high school ceramics students how to make them. Their work is beautiful!